Final whistle of the football game and the teams gather in the changing rooms. The team’s coach will have to take a logical view and gather the team to discuss areas of improvement. Similar to this, whether you are new to Agile or a ‘player’ for years, there are high chances you have already heard or even participated in a sprint retrospective. What is this all about? By definition, retrospective brings to mind the look back to past events or situations. 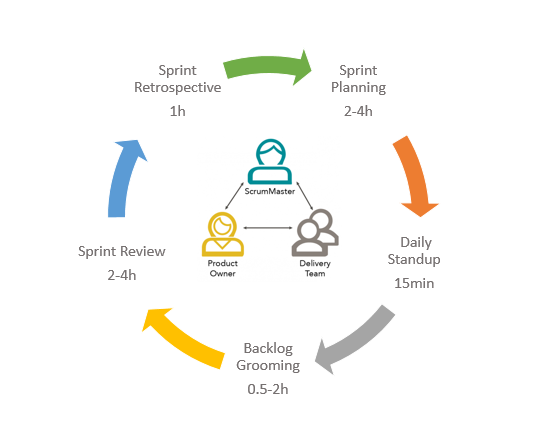 With Sprint being the heart of Scrum, its retrospective is an opportunity for the Scrum Team to inspect itself and create a plan for adaptation to be enacted during the next Sprint. It is the team’s formal meeting to reflect on the work that was done, the goals achieved along with potential ideas for further improvement in the next iteration. Let’s firstly clarify the typicals. Who – The Scrum Master is the one responsible to ensure that the Sprint Retrospective meeting occurs and the entire Scrum Team including him and the Product Owner participates. What actions need to be taken to improve the development process? When – A Sprint Retrospective meeting takes place after the Sprint Review and prior to the next Sprint Planning. To depict this sprint meetings order imagine an ongoing circle with the Scrum Team in the middle as it’s mostly mandatory for them to attend. How Long – According to the Scrum Guide, for a Sprint of 4 weeks the sprint retrospective meeting should last maximum 3 hours. For every week there is equally a 45’ time-box, so for a standard 2-week sprint, the meeting should last max two football halves. Intro: Break the ice by bringing up a brainstorming activity to engage the participants in the retrospective. Have in mind, that the meeting gets truly effective only if the team feels comfortable to open up and share the honest results. Analyze the Insights: You have already identified the blockers within the previous step and it is now the turn to generate process improvements and move your team in the right direction. Did you recognize a duplicate or pattern whilst working on a product component? If this can be developed and benefit the Development team it is now the time to do so. Follow Through with Actions: Encourage the team to take decisions on action items and get prepared for the next sprint in order to further improve their work. If all the previous steps have been followed correctly, opportunities should have been identified and it’s better to have them discussed and start moving your team forward to the next iteration. Wrap up: Try to keep this step short by summarizing the observations and encouraging the members to share their personal takeaways from the process. As previously mentioned, openness must be endorsed and the whole meeting should be completed with a “lessons learned” attitude, so the members adapt during the next iteration. Taking into account the above, a matter to keep in mind is that the same agenda for many retrospectives might end up becoming monotonous to the participants. To avoid such a scenario of them perceiving it as a boring procedure, we have gathered our favorite retrospective templates, so you give the whole process and your team the fun needed. One of the most well-known techniques within Agile, that is reported to be appreciated by teams due to its simplicity, is the Sailboat. 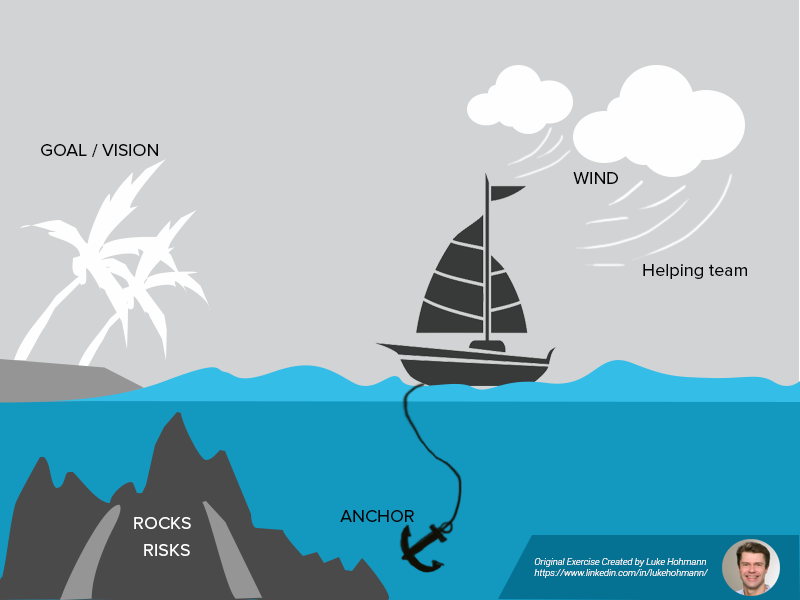 Using a flipchart or a whiteboard, start by drawing a sailboat, clouds, rocks, couple of islands and an anchor as the illustration below depicts. Every member is on board sailing to reach the islands which represent the teams’ goals/vision. The clouds and the wind propel the boat forward, whilst the anchor represents all the impediments that will slow its journey. Similarly to the ocean, rocks do exist underwater and exemplify the risks that the team might face towards the journey. Start the exercise by writing down the overall goal and vision of the team, then invite each member to brainstorm and place their ideas written on sticky notes under each area. What did they feel helped the sprint move forward and what slowed its speed? As a next step, group the answers and ask the team to verify whether the grouping is fair or not, encouraging openness and discussion around any changes that they feel are needed. Last but not least, ask the members to decide the items that they feel are critical to focus on and identify areas that could be improved. They will then be able to define the necessary actions to fix any issue and close the retrospective. Despite the simplicity of the exercise, it can easily accommodate more than one team at the same time. If you feel that there is high dependency between two teams, then it might be a good idea to conduct a common retrospective meeting to analyze the positive and negative effects of each one’s performance. Furthermore, making use of an online tool enables you to work on adding notes, even with distributed members, allowing you to do everything to run the exercise. Start by drawing the five roots of the tree that act as visual metaphors to the Scum values (Commitment, Openness, Respect, Courage, Focus). If any member of the team has not clearly defined these values, make sure you take the time to explain each quality whilst listing them on a board. 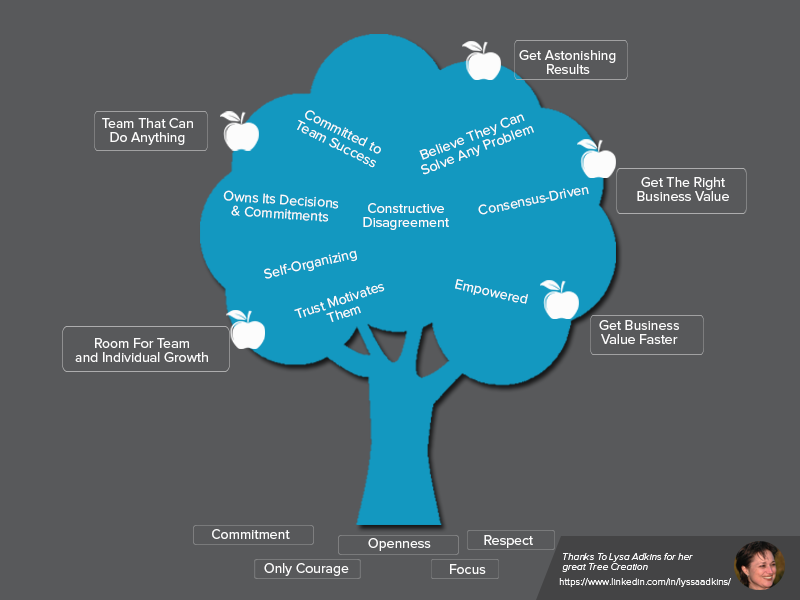 To continue, encourage your team to start sharing their beliefs of high performance traits, these would be represented as the leaves of the tree. To give you an example: Self-Managed, Team Problem-Solving, Trust, Empowered can be among the characteristics of such a team of high efficiency and success. After connecting the leaves to the roots, it’s about time to start thinking of the tree’s fruits. The metaphor icon of the fruit here depicts all the characteristics that the team will endorse to get both as a team and at a personal level. The exercise though can take you even further to discussing the potentiality of having blockers on the way to getting these high performance characteristics that you might admire. Following and practicing agile is not just working perfectly on its methodology. If you don’t pay attention to the values and the “fruits” you want to get, you will soon start working mechanically and your team will get demotivated. This is exactly what we believe to be fighting for using the metaphor of the tree. A simple drawing that will encourage your members to share their ideas and get motivated to create the path to the desired high-performance. At the end of the day, what would a tree be without strong roots and water? With this technique, you should expect an extended evaluation of the typical three questions that are covered during a retrospective meeting. The starfish will use five sections to give you an overview of what is working and what is not within your team. Stop – Here you will include all the activities that do not bring value into the process, the impediments that your members need to get over to optimize their developments. Less – Whether these activities have been brought to the team in the past or ran as a test, if the required effort to perform them is much more than the benefits brought they need to be minimized. Keep – Actions that the team must keep on exercising as they bring value to the overall product and process of development. More – Activities that work well and bring value to your team and the organization. Include all the actions that you need to focus and perform more frequently. Start – New activities that the team wants to introduce and start performing. To make the most out of this exercise, do pay attention to the order these five sections get analyzed. 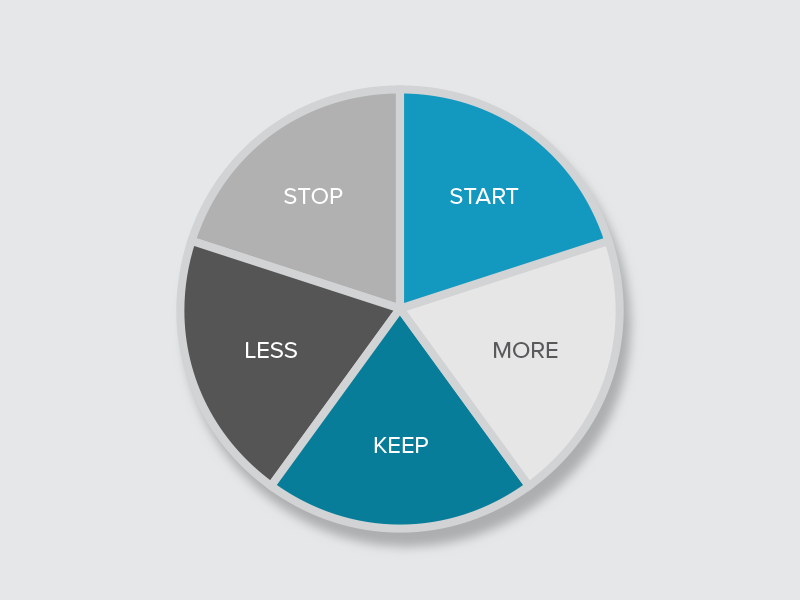 Starting with the STOP part will allow your team to dump the ideas that they want to get rid of and continuously the positive topics will motivate them to introduce the initiatives for their next sprint. Since Start section will be the last one to get analyzed, you may encourage the team members to vote, sorting by importance, so you decide democratically and as a team which idea will be the most crucial to start with. Simplistic, easy to understand and sufficient, the starfish will cover both the negatives and positives moments of your last iteration. Having this in mind, although there is no recommended occasion to apply it, the discussion can get truly interesting and efficient after several ups and downs have been recorded during a sprint. Furthermore, the sections and the recommended order to follow can assist your team into building little by little on progress towards success. Last but not least, it doesn’t require collocation of the members involved so it can get truly handy when combined with a tool online to accommodate the sharing of ideas remotely. 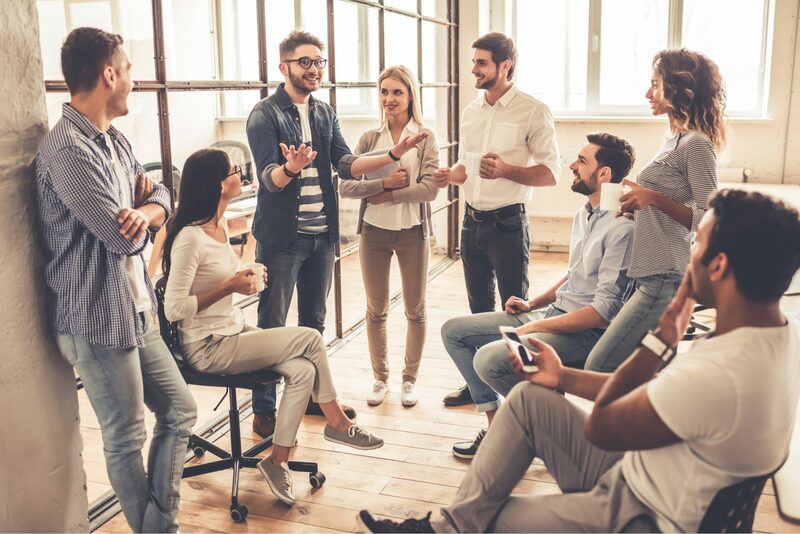 Conducting a retrospective meeting is by far one of the most valuable processes when applying Agile and has tremendous power to inspire change for the members involved. This is not to say that success is guaranteed, but having such a meeting at intervals to discuss the negatives and the positives is a great point to start with and improve your products. This is also the reason behind the popularity of Retrospectives, they are established to promote improvements in a team on a regular basis. Whether you decide to give a go to our top three exercises or not, keep in mind that spicing up this meeting is crucial to keep your team excited and motivated for new challenges. Unlike the latter, conducting it in a poor way will end up turning into a blame game within the team.